Executive Mosaic is honored to announce Paul Smith, senior vice president and general manager of Red Hat‘s public sector business, as an inductee into the 2017 edition of the Wash100 — Executive Mosaic’s annual selection of the most influential voices in the government contracting arena. The 13-year company veteran heads a business unit with coverage of the U.S. federal government and its operations around the world, as well as domestic programs associated with the education and state and local government sectors. His responsibilities at the company span across sales, marketing, channels, consulting and strategic planning. Red Hat has pursued certifications in its efforts to provide government customers technologies that meet requirements such as the Common Criteria international standard for information technology security and the National Institute of Standards and Technology‘s Federal Information Processing Standard 140-2. The company secured the Common Criteria certification at Evaluation Assurance Level 4+ in October 2016 and nine FIPS 140-2 certifications in December for the Red Hat Enterprise Linux 7.1 operating system. “Protecting highly-sensitive data, from employee and customer financial data to national security details, is a critical need for modern IT departments, particularly those operating in the public sector,” Smith said. Smith also noted at the 2016 Red Hat Government Symposium in November that the use of an open source development model in government agencies’ digital transformation efforts works to balance choice and security. 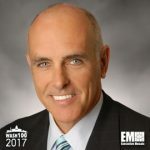 The technology marketing veteran has more than 30 years of experience and has worked at Veritas Technologies, Netscape Communications, Oracle and Unisys before joining Red Hat. Executive Mosaic congratulates Paul Smith and Red Hat for their selection to receive this award.